You are here: Home / Giveaway / Want to join me for Trivia? I’ve got some tickets to an event to give away. If you’re in Sydney, and would like to come along, I might give them to you! Next week is Brain Awareness Week, part of a global campaign to raise awareness about the benefits and progress of brain research. Did you know that there are over 1,000 diseases and disorders of the brain, most of which do not have a cure? That more than a quarter of the Aussie population will experience a brain disorder sometime in their life? True story. It touches us all. Members of my immediate family have suffered acute brain injury. My grandmother has dementia. Some of my closest friends have experienced neurological conditions and lost family members to what can be destructive and degenerative diseases. It’s touched me. Maybe you too. As part of Brain Awareness Week, there are events happening all over the country and globe. 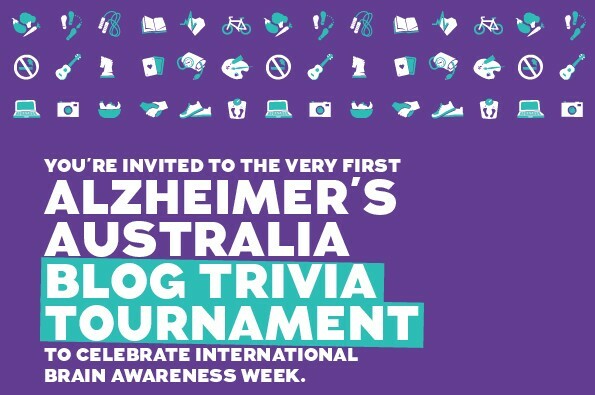 The one I’ll be at – and you can be too – is the Alzheimer’s Australia Blog Trivia Tournament. What: A fun night of trivia. Food and drinks. Shared with whoever populates our no-doubt-interesting table + the other tables around us. Why? Keeping your brain active is important for your cognitive health at every stage of life. We can do this by being mentally stimulated and engaging in social activities… which just happen to be two major ingredients in trivia events such as this! There are limited places available, and I’d love to offer them up for as many of you that I can. The only criteria: that you’re available and would like be part of the night. You don’t even have to be good at trivia! Disclosure: you’ll be sitting on a table with me… and I am NOT good at trivia events – I get too excited and flustered! However, I will be bringing my husband, who is some kind of savant that excels in these situations. So, that kind-of balances it out. If you are in Sydney and you would like to take part in this event, please leave me a comment below, via Twitter or on my Facebook page, with your details and a few words about why brain health is important to you. Also let me know if you would like to come alone or bring a friend, so that I can factor that in with the number of places. I’ll finalise the seats on Friday, and will let everyone who’s been successful know by the afternoon. That way you can spend the weekend boning up on facts. Joking! Looking forward to hearing from you and getting together our table of interesting folk. Thank-you for the invitation Kathleen. I hope the evening is a stack of fun, and a brilliant success!